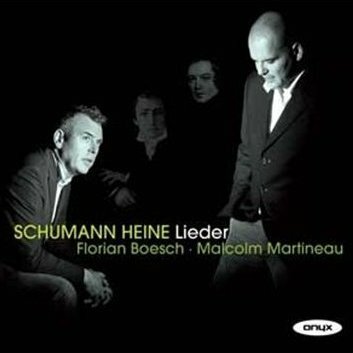 Some nine months after Gerald Finley released his extremely well received disc of Schumann's Heine settings on Hyperion, we have this excellent recital from Austrian baritone Florian Boesch. While Finley based his disc around Dichterliebe, Boesch chooses the Op.24 Liederkreis; the rest of the programme – including 'Die Beiden Grenadiere', three numbers from Myrten and the rip-roaring 'Belsazar' – is common to both discs. Boesch, who studied with Robert Holl in Vienna, is a younger singer whose reputation in the UK is quickly on the up. High profile appearances in European opera houses, including Papageno in Zurich, have been followed in the UK by appearences at Wigmore Hall, as well as concerts of Schubert cycles at the Cheltenham and Oxford Lieder Festivals. This new disc further cements his position as an artist to watch. Both vocally and temperamentally, too, he sounds ideally suited to Lieder, singing with easy style informed by a straight-forward, idiomatic way with the text. The voice itself is not as robust or smooth across the range as Finley's, for example, but is still a very beautiful instrument employed with immense sensitivity; listen as a demonstration to the lightning-fast contrasts between introspection and declamation in 'Schöne Wiege meiner Leiden' from Liederkreis. Boesch's natural skill at creating a feeling of quiet reflection makes for a Liederkreis that gently emphasises Schumann's Innigkeit. Although he's perfectly willing to whip up a storm in 'Warte, warte, wilder Schiffmann', he is at is very best in songs such as 'Es treibt mich hin, es treibt mich her', delivered with a moving simplicity that is beautifully matched by Malcolm Martineau. His 'Lieb' Liebchen, leg's Händchen' is suffused with deep melancholy from the very first words; such is the feeling of resignation Boesch achieves that we almost imagine him simply giving up before the final line. It's not all miserable, though, and with 'Mit myrten und Rosen' he brings the cycle to a close with considerable passion, although even here he cannot resist paring his voice down to nothing at the end of some phrases; in a less persuasive singer this could seem artificial, but for me Boesch pulls these effects off convincingly. In the selection of Romances and Ballades that form the centre of the disc Boesch captures the contrasts in charm, delicate melancholy and desolation in 'Der arme Peter' and gives performances of 'Die beiden Granadiere' and 'Belazar' which are full of authority and power, naturally paced and delivered with panache and poise. The three songs from Myrten – 'Du bist wie eine Blume', 'Was will die einsame Träne?' and the exquisite 'Die Lotusblume' – capture Boesch again in reflective mood, in beautifully turned performances. The same can be said for the rest of the disc: the diptych that makes up 'Tragödie' Op. 64 No.3 is ardent first, then introspective, while we conclude with four choice off-cuts from Dichterliebe where 'Dein angesicht' lilts seductively and 'Mein Wagen rollet langsam' is dreamy and languorous. A very fine disc, then, of Lieder singing. Boesch sounds so much at home in the medium that any doubts one might have about his interpretations – mainly a tendency to bring the voice down to almost nothing – seem less calculated tricks of the trade than a natural desire to communicate the songs' intimacy, tell a story and have us share in the deeply personal sentiments of much of the poetry. As already mentioned, Martineau is entirely at one with his singer, providing accompaniments to match Boesch's approach. Onyx's sound is clear, well-balanced and detailed.